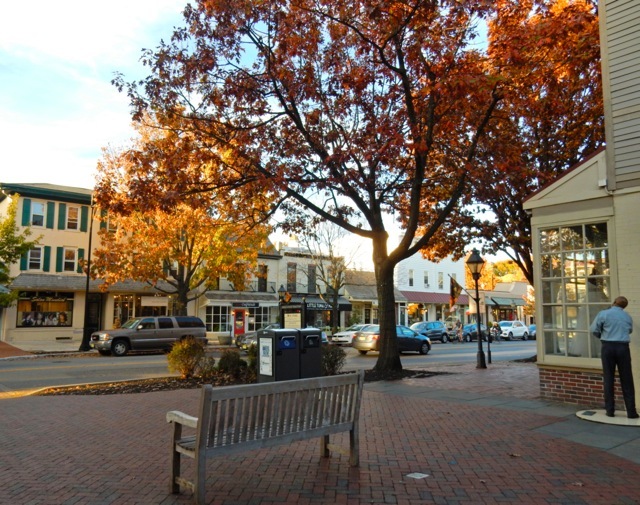 Here's news: some towns in Southern New Jersey - in this case Haddonfield, Somers Point and Cape May - are community-minded, friendly, sophisticated, foodie-approved oases in what many outsiders believe to be tackyville USA. Indeed, if all of your information about New Jersey comes from TV - Sopranos, Boardwalk Empire, Jersey Shore and the like - or from the 70 MPH view of oil refineries out of your windshield as you whiz by on the Jersey Turnpike, you might imagine the state as a crime-ridden, cheesy, polluted place. Plan a visit here, though, and you'll see that just isn't so. What you will find are "walking school buses," Historic Preservation pioneers, crabbing tournaments, great chefs, beachfront hotels built by Holocaust survivors and so much more. The following 20 reasons to visit South Jersey are just a start. For more information on each of these towns and other Offbeat Escapes in the Northeast, consult GetawayMavens.com. 1. The first nearly complete dinosaur skeleton in North America was found in Haddonfield NJ. 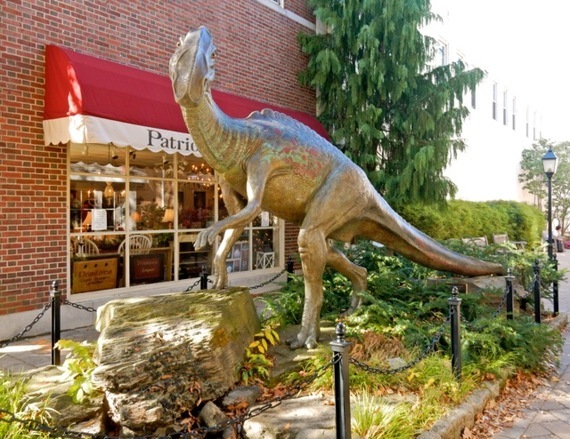 According to the history books, Haddonfield is "Ground Zero" for dinosaur paleontology in the Americas. In 1858, the bones of Hadrosaurus foulkii, a late Cretaceous duck-billed dinosaur, were unearthed here. To memorialize this historic event, locals commissioned the 12-foot bronze Haddy the Dinosaur Commemorative Statue, which was unveiled in 2003 in a little pocket park on Haddonfield's main street. What happened to the actual Hadrosaurus skeleton? It's on exhibit at the Academy of Natural Sciences at Drexel University in Philadelphia. 2. Haddonfield was named for 21-year-old Elizabeth Haddon, whose father, John, purchased 500 acres in New World in the late 1600's. Due to illness John Haddon was unable to leave England, and so in 1701 he sent his formidable daughter, Elizabeth, to New Jersey alone. She thrived, proposed marriage to a Quaker minister, and together they built the first homestead here in 1713. 3. Downtown Haddonfield streets are so precious and picturesque, they've been compared to a Dickens scene, especially during the holidays when the town is aglow with candlelight. It's a Truman Show kind of place where locals actually say "good morning" to strangers and engage with parents and kids on the daily "Walking School Bus," a procession past brick storefronts and beautiful stone churches to blocks-away Elementary, Middle and High Schools. 4. 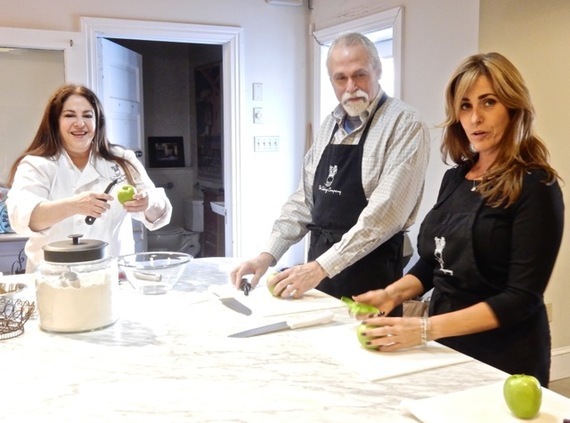 Cooking along with Chef Kathy Gold at In the Kitchen Cooking School (Haddonfield) is a blast. Chef Kathy's instruction method boils down to, "bring the wine (for the meal) and we'll have some fun." She teaches the fine art of food preparation - e.g. Indian, Italian, Holiday cuisine - sometimes by sight, sometimes "au pif" - by the nose - but always simplifying even for those of us who find it a challenge to boil water. 3-hour classes run six nights a week (and Sunday afternoon) and cost $70, which of course includes the meal. RSVP required - sign up online. 5. 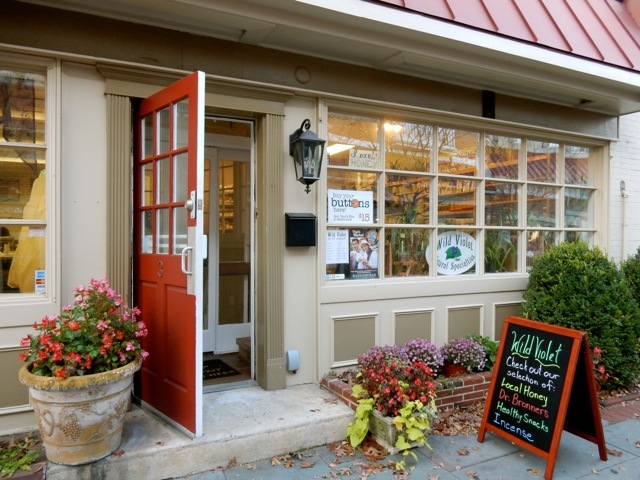 The independently owned stores in downtown Haddonfield make for a great shopping day trip from Philadelphia, just a 20-minute drive away. While Harrison's Gifts have been around for decades, newbies like Gorshin (cultivated as "man cave meets general store," owned by Mitch Gorshin, son of actor, Frank), JAX (young-women's fashion), Fun in the Sun (preppy resort-wear), and Wild Violet Natural Specialties (healthy, yummy snacks, skin care and home goods) are just a few of the great shops drawing many new and returning customers. 6. Lunch portions at Zaffron, a sweetheart of a family-owned Mediterranean-fusion eatery (Israeli, Greek, Turkish, Southern France and Sicilian cuisine) are perfectly sized. To find out just how perfect, order the delectable Lamb Kabob platter, which comes with a small mound of golden rice and colorful grilled vegetables. 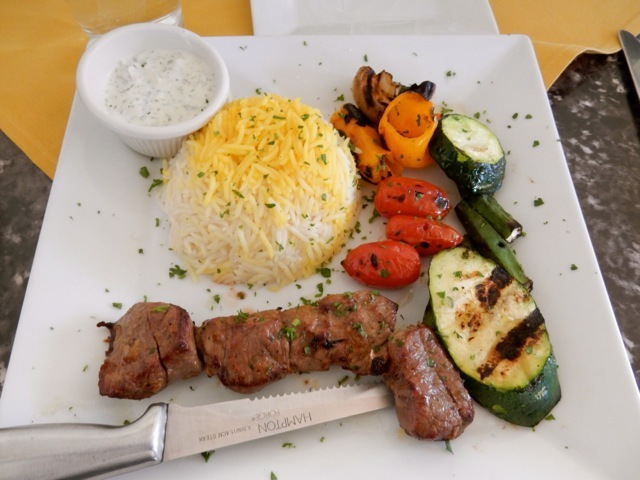 Though Zaffron specializes in lovingly made, fresh from scratch food, and every dish that emerges from the kitchen is wonderful, the lamb dishes are particularly exceptional. 7. You gotta have the Chicken Parm at Tre Famiglia, Haddonfield. 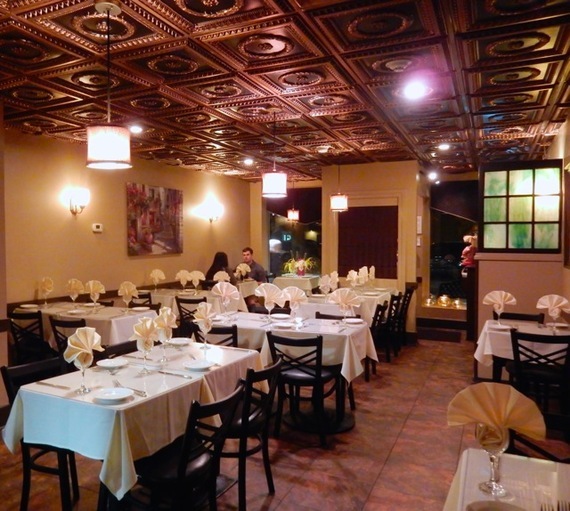 This Traditional Italian spot is as small and intimate as its portions are big. Hand made pastas, creamy risotto, and braised short ribs shine here, but if it's your first time, order the signature Chicken or Veal Parmesan: crispy, succulent, gooey, sauce bursting with flavor. No wonder Tre Famiglia has won Readers Choice Awards from a variety of publications. 8. 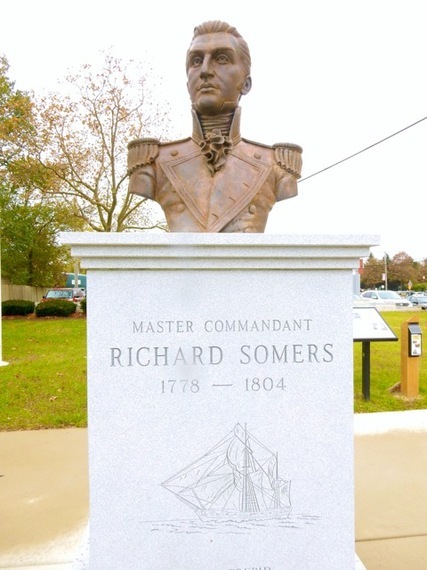 Town namesake, Col. Richard Somers, was buried in Tripoli, Libya in 1804 after dying a hero in the Barbary Wars protecting trade routes off of North Africa (where pirates were hijacking merchant ships from the newly established USA). In fact, the famous Marine Hymn, "From the Halls of Montezuma to the Shores of Tripoli," refers to these forgotten wars. At the age of 26, Somers commanded the "fire ship," Intrepid- a maritime Trojan Horse rigged to explode near a flotilla of enemy ships. Somers was on the Intrepid as it snuck into Tripoli Harbor and blew up prematurely - killing him and his men. Somers is still buried in Tripoli, though his descendants and locals have been working to repatriate his remains. 9. 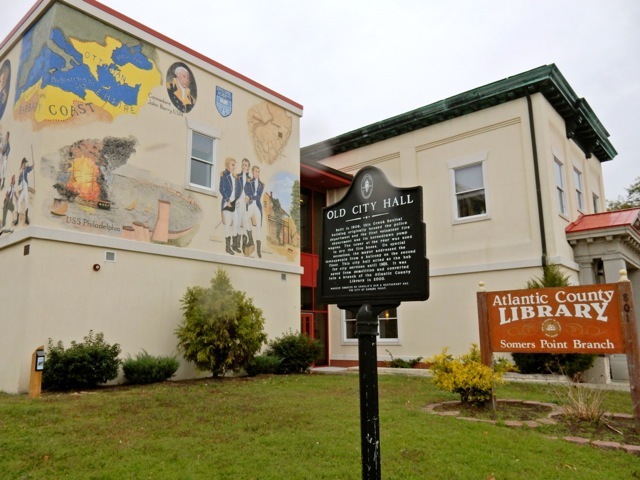 The story of Somer's life is rendered in an outsize mural that wraps around the Somers Point Library, a marvel of grass-roots historic preservation. What is now the library was the stately Town Hall/Police Station/jail, built in 1906 and falling apart by the time concerned citizens banded together in the late 1980's to save it. Led by builder/historian, Kirk Gerety, the newly named Somers Point Historic Preservation Commission appealed to locals for funds and then reached out to casino owners in Atlantic City - ten miles away. Most, including Merv Griffin, donated to save the historic building. 10. After WWII, Somers Point, which had always been a drinking town, became a rock and roll hub. 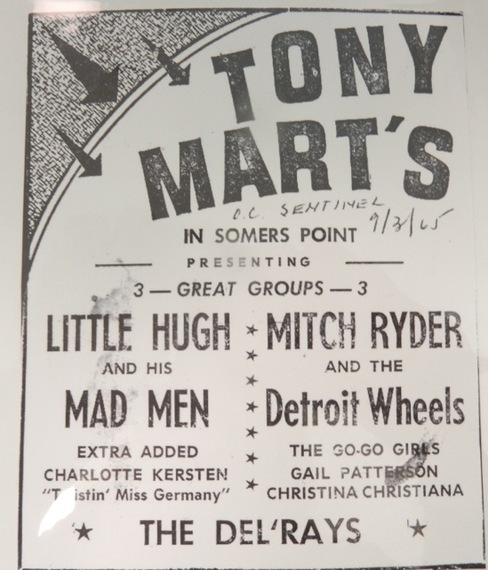 "In the 50's and 60's you couldn't walk down Bay Ave without bumping into hundreds of college kids going from nightclub to nightclub," recalled Sally Hastings, Director of the Somers Point Historical Society. Tony Mart's house-band, The Hawks, often opened for other acts. Though he never came to Somers Point, Bob Dylan heard about the Hawks, and later hired them to be his band, subsequently known as The Band. 11. The Somers Point Historical Society houses stacks of loose-leaf binders, categorized by theme and crammed with thousands of historic pictures. 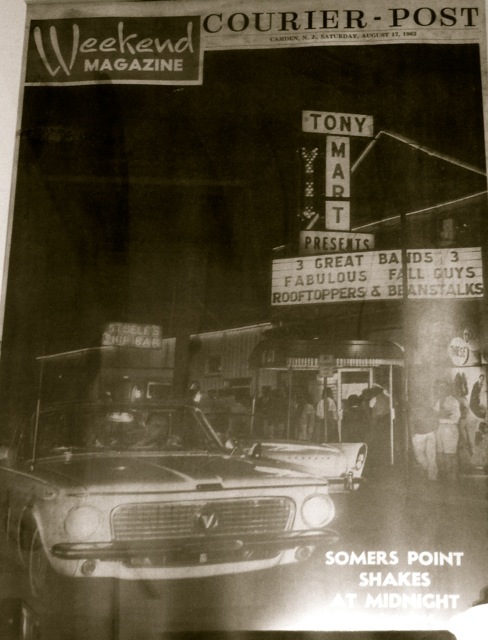 Most entrancing, the book of ad clippings from Tony Mart's Club, one of the most prominent music venues in town- promoting Haley and the Comets, Levon Helm, Mitch Ryder and the Detroit Wheels, Conway Twitty before he went country, and other rock legends. 12. Once a shipbuilding hub, Somers Point became a mecca for recreational fishermen and still is. Surrounded on three sides by water, the "back side," Patcong Creek, is such a crabbing hotspot, it's the site of the country's only national crabbing tournament, Assault on Patcong Creek, that last year saw over a thousand contestants. Families can try out this fun sport on a Fun Time Crabbing Charter. Those who'd like to drift along quietly on the Bay for flounder - aka, fluke - secure a space on the pontoon party boat, Duke of Fluke. 13. Join the "Key West" like crowds at sunset on the new 2 ½ mile Route 52 causeway that links Somers Point to Ocean City NJ. The view from the mid-span walk-and-bike path over Great Egg Harbor Bay is spectacular. 14. 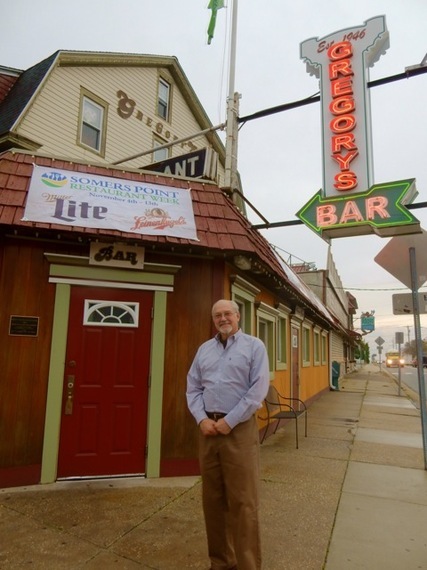 Taco Tuesday was invented at Gregory's in Somers Point, a third and forth generation run restaurant famous for its locally sourced, never frozen foodie-approved cuisine, award-winning Breakfast Bacon Burger, and Snapper-Turtle Soup. Back in 1979, Gregory's enticed patrons out on Tuesday nights by serving inexpensive tacos. Taco Tuesday was so popular, the Gregory's trademarked the name in New Jersey, but didn't peruse it further, so in 1982, the chain Taco John's appropriated the name for national use. From the outside, Gregory's looks like your typical old-school neighborhood bar, but just step inside. Decor is updated and upscale, and the food, well, lets just say that Chef Paul was recently asked to appear on Top Chef (but declined due to family duties), so you won't find your ordinary tavern grub here. 15. 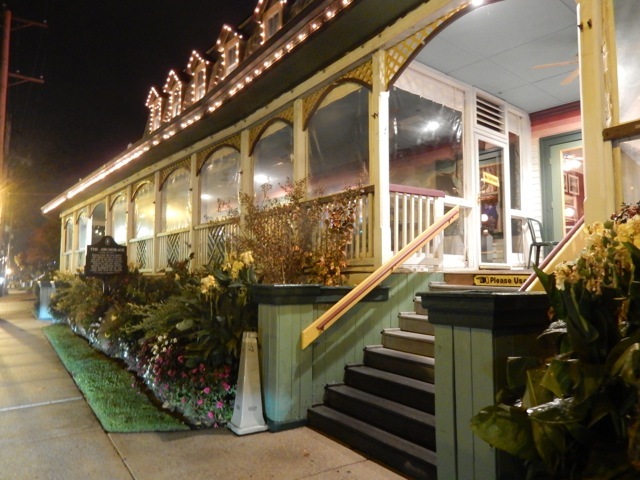 Though the Anchorage Tavern in Somers Point has been feeding hungry fishermen since it was built (as a hotel) in 1874, and famously known for its "7 beers for $1" deal in the 1970's, this renovated restaurant, now helmed by C.I.A. (Culinary Institute of America) grad, Don Mahoney, reached national prominence on Diners, Drive-Ins and Dives last year. Mahoney made his famous Gorgonzola Flounder with Lump Crab Stuffing, but his Ricotta Meatballs are astoundingly good. Everything on the menu, in fact, is a Mahoney favorite ("that's why you won't find any lamb dishes - I don't like lamb," he says), and so well prepared, expect a two-hour wait for a table in summertime. 16. 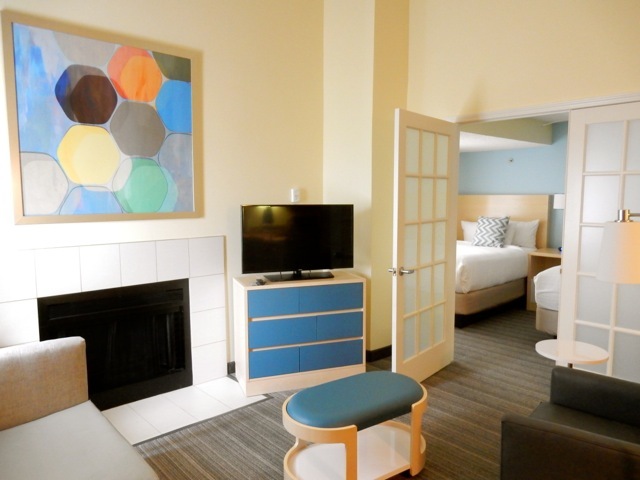 For a small town, Somers Point has a couple of nice, upscale and updated hotels. The colorfully decorated, contemporary Sonesta ES Suites sits right on a marsh across the street from the town Golf Club. The more traditional Pier 4 is right on Great Egg Harbor Bay. 17. A vacation spot since the late 1700's, Cape May NJ attracted city dwellers who would travel by packet steamers down to the shore. There, they'd "bathe" in the Atlantic Ocean, essentially bobbing up and down in the waves wearing barbell-heavy woolen "bathing attire." Since then, Cape May tourism has waxed and waned. A fire in 1878 destroyed nearly every home in the Historic District, leading to an almost instantaneous building boom - creating the concentration of Victorian Homes that survive till today. In 1976, this collection of vividly colored Cape May NJ Victorians earned designation as a National Landmark Historic District, and since then tourism has once again been on the upswing. 18. 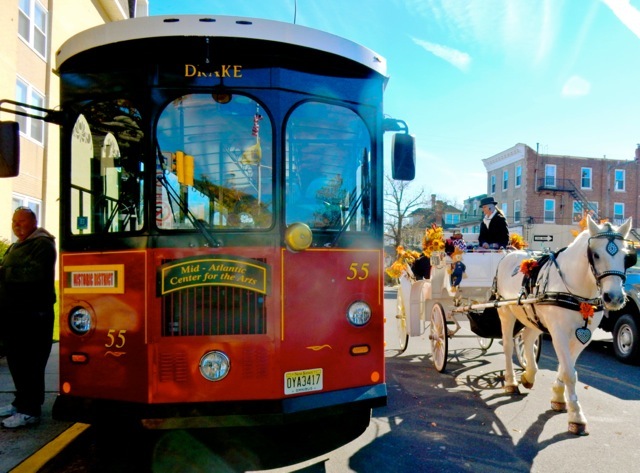 The best way to see these charming Gingerbread homes, and to tour the interior of one of Cape May's mansions is through a MAC (Mid-Atlantic Center for Arts and Humanities) Trolley Tour. Though MAC runs a series of year round and seasonal tours, first timers will want to take the Historic District Trolley Tour combined with a tour of the Emlen Physick Estate. Driving slowly up and down shaded streets lined with meticulously restored homes, you'll learn that all these vibrant paint jobs are actually a latter-day attempt to jazz up the formerly muddy brown and mossy green pigments favored by the Victorians. Hugh Street is the most picturesque; an array of shaded private homes embellished with delicate ornate woodwork known as Gingerbread or Carpenter's Lace. 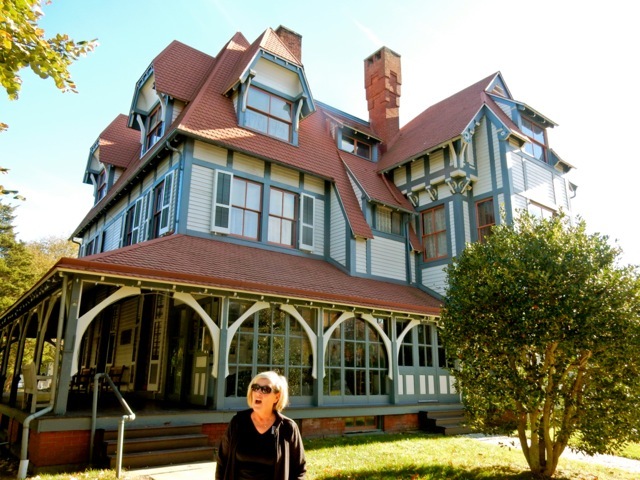 The Physick Estate, designed by Frank Furness, was the first Cape May Victorian to be saved by MAC, and its restoration, both inside and out, will delight anyone with a passion for architecture and design. 19. Cape May Brewing Company - owned by Ryan Krill (the finance guy) and Chris Hanke (engineer), friends from Villanova U - sold its first keg of beer in 2011. 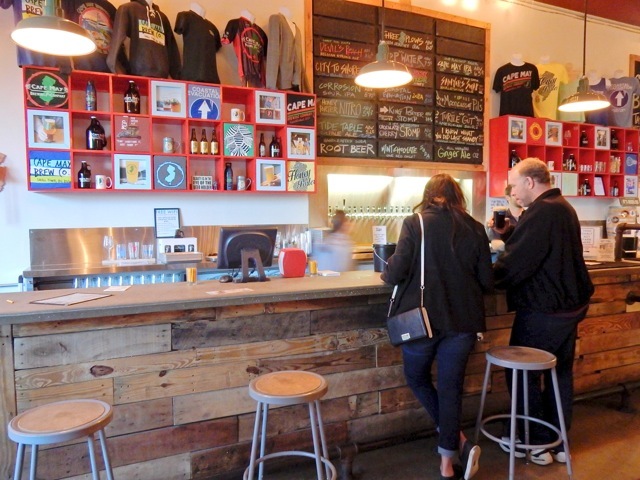 Since then the Brewery has grown to 45 employees, including brewmaster Jimmy Valm, who concoct beverages with names like Mop Water (5-spiced ale), Coastal Evacuation (Double IPA) and I Know What You Did Last Shandy (self explanatory). Cape May Brewing is the largest microbrewery in Southern NJ, and for now self-distributes throughout New Jersey and the Philly area and is branching out fast. Come in for a taste or five - and if you're here on select winter Thursday evenings, participate in a Fireside Chat - when the owners, master-brewers and occasionally local farmers delve into the intricacies of the beer at hand. Check website for dates. 20. The back-story of the beautiful full-service beachfront Montreal Beach Resort, (nowhere near Canada), is a harrowing one. Harry Hirsch and his twin brother were born in Poland, sent to Auschwitz at 21, and managed to survive the Nazi Death March by saying alive beneath heaps of dead bodies. Harry met his wife, Sophie, in a Displaced Person's Camp, and they moved to the US in 1951, becoming chicken farmers on the Jersey Shore. In 1966, before it was deemed a National Landmark City, Cape May was a sleepy residential town, so the Hirsch's took a big leap of faith purchasing beachfront property just east of town. They built a 27-room inn and named it Montreal Beach Inn to attract an influx of Canadians starting, at that point, to make their way South to Florida. "This was the first warm beach they'd hit on the drive down," said Harry's sons, Larry and Joe Hirsch, who now run the upgraded 69-room property with Larry's son, Jonathan. 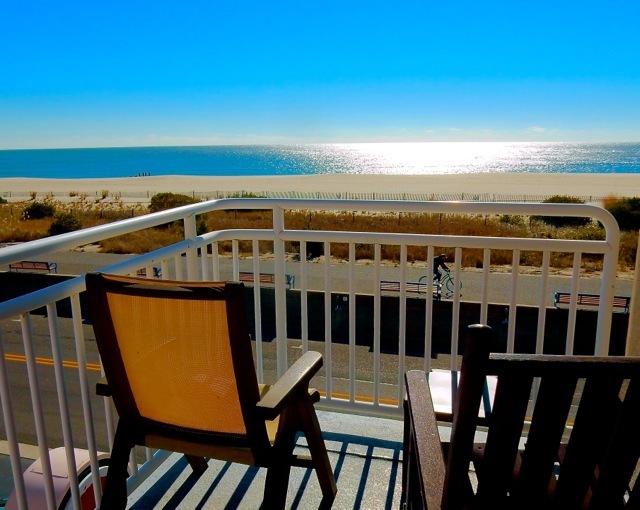 Fifty years later, the Montreal Beach Resort, with beach service, pool, on site restaurant, rooftop bar and its own liquor store, is one of the best hotels in town, drawing families year after year.